There are many variations to this fish and it has a reputation of being easy to keep. Unfortunately this has often led to its demise as they are sometimes kept in unsuitable tanks. As with any fish, they require optimum water conditions. 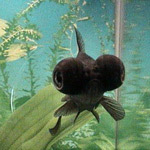 The Black moor is a telescope-eyed variety of fancy goldfish that has a characteristic pair of protruding eyes. It is also referred to as popeye, telescope, kuro demekin in Japan and dragon-eye in China.